Most of the time when we receive negative feedback, our impulse is to react defensively. Even when we try to veil our discontent with the rater, our contempt bleeds through. There’s nothing worse than a petty seller. Take the high road. 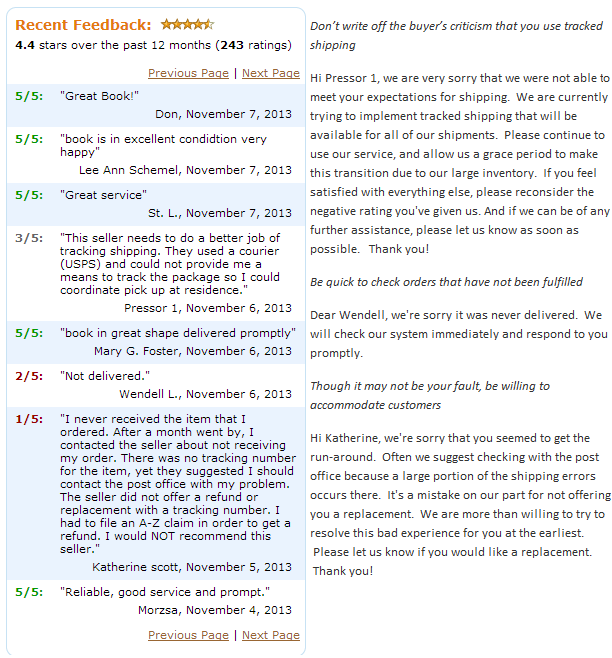 Make sure your responses to negative feedback on Amazon are considerate, professional, and humble. Accept criticism, be prompt, and be accommodating. In the case of Pressor 1: you could easily dismiss the rater as being a diva. Instead, you should indicate to him that your operation unfortunately is not as nuanced and advanced as he prefers. His comment, then, will be conveyed as personal preference. When you accept criticism over individual preference, it will make you sound gratuitous. In the case of Wendell: Respond quickly. Time is of the essence. Keep it brief to highlight that you are already on it. In the case of Katherine: Own up to the mistake by taking responsibility for poor management and customer service. Offer a chance to make amends and to start the business relationship anew. Most importantly, prompt responses will generate a more favorable image for your business since most of the complaints can be resolved with better communication and customer service. Using feedback software, you can gather, sort, and manage your feedback with greater efficiency and results.